Wow, after discoveing 40 odd dwarf galaxies yesterday I had to stop myself from keeling over when I spotted this galaxy tucked away in the smaller thumbnails of the Hubble 18th anniversary press release. This is something phenomenal. 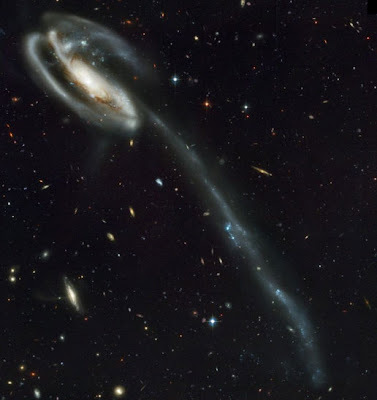 Compare the galaxies below, the first is Markarian 273 and the other is the Tadpole galaxy. Many of the neighbouring galaxies in the field of Mrk 273 share the same morphology as the neighbouring galaxies in the Tadpole field. Just like I predicted. Shame I'm still writing that paper! At the moment I'm too busy grant bid writing to do proper research so I have decided to ban all telly and do research in the evenings whilst grant bid writing and creating educational programmes for IYA 09 during the day. Since starting this blog last year I forgot to give a breakdown of what the Cosmic Diary actually is. Cosmic Diary is one of the 11 Global Cornerstone Projects for the International Year of Astronomy 2009. The Cosmic Diary isn't just about astronomy, its about portraying the human side of the astronomers themselves. The Cosmic Diary will be a glimpse into the daily lives of astronomers worldwide, creating a blog in text and images, (and in my blog movies), reporting on their life, families, friends, hobbies, interests, their latest research findings and the challenges that face them in their research and work. Outside the observatories, labs and offices, astronomers are parents, photographers, athletes, and musicians. At work they are managers, observers, graduate students, lecturers, grant proposers, instrument builders and data analysts. Today I was blown away by the latest Hubble release to celebrate 18 years of the Hubble Space telescope. Little did I know whilst flicking through the latest press release images I would make a major discovery! For the past 7 years I have been working on the theory that dwarf galaxies have an uncanny resemblence to galaxies in their local neighbourhood. 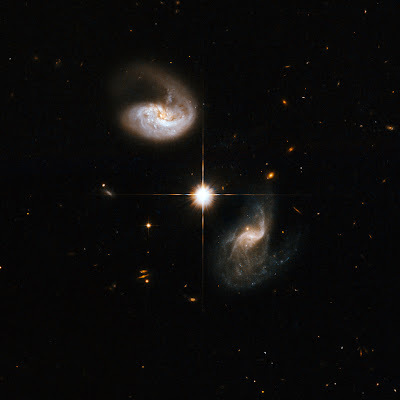 What strange mechanism could be causing these dwarf galaxies to share the same morphology as their neighbours? Could it be gravitational? could it be, as I presume electromagnetic effects due to the large amounts of plasma in the region? Who knows.... only lots more hours spent researching the pictures and comparing these with multiwavelength images of the same region will tell. Spot the pair of dwarf galaxies at 8 o'clock of the bottom galaxy in this image second image! 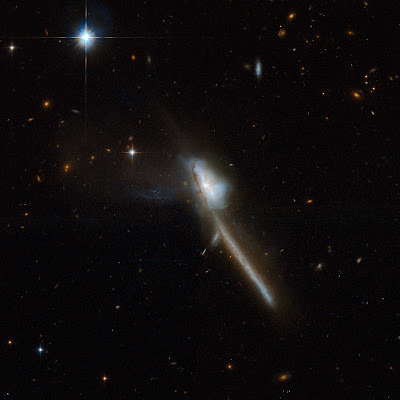 They are the exact same morphology as the two larger interacting galaxies. Oh and by the way, whilst on the subject of Susan, Egypt, Mearim and that dreaded stomach bug we picked up from eating a fruit cocktail in downton Cairo, here is a link to Susan's blog! Could we be having another CAP in the UK? Last year a number of astronomers and science communicators met in Athens for the Communicating Astronomy to the Public Conference and a number of us decided that there should be a CAP 08 or CAP 09 at least. Sat round the dinner table in Athens a number of us drunkenly decide that we should hold it in South Africa.... or should I say the question arose over dinner and Kevin Govender (as usual) shouted Africa! So now with a CAP 10 taking place in the evaluation year of the International Year of Astronomy in SA we have a rather large gap of events taking place where the participants in IYA 09 can get together and consolidate what we are planning and what we have so far accomplished. At the moment myself, Tracey Parker of Leicester University (Widening Participation and UK Space School), Rob Hill of NISO and Ian Robson and Steve Owens are looking at having a pre-meeting at the ASTRONET Symposium on the Wednesday afternoon, perhaps as a parallel session or a lunchtime meeting to discuss who would be interested in attending the conference and what kind of setup it should have. At the moment myself and Tracey are in favour of having a show and tell setup rather than just a series of 15 minute presentations. Its better to show people and talk about what you are up to rather than some of the types of presentations at CAP 07 where some of the speakers forgot they were meant to be science communicators.... enough said (some of those presentations were rather tedious!). Universe Awareness is getting there, painfully slowly with development and coordiantion by myself for the UK and a number of internationally based colleagues who are all equally enthsiastic and equally nuts, in a nice way might I add. Hey, this is what makes the UNAWE community so unique, you have to have a sense of humour and an undying passion to foolow your new found friends to foreign lands to see what they are up to and participate in delivering their activities... at some point those piccies of me and Susan Murabana (Kenya - Global Hands on Universe) in front of the Pyramids will appear. The Galileo Teacher Training Programme will be developed for both primary and secondary schools. I'll expand on this later in another post, I suppose one good thing about the Cosmic Diary project as a whole is the way that astronomers are portrayed to the general public. Right now I am rambling as I am extremely tired after spending 7 hours in the office building our website for Setpoint Greater Manchester www.stemsalford.org and organising filing cabinets for moving office. Oh, and also writing grant bids (which seems to be taking over my life at the moment but hey, someone has to do it!). Alex, my son is asleep now and I have spent some time today chatting to friends on Skype testing out our new webcam. I'm planning on going over to Italy next week to meet with Franco Paccini at Arcetri Observatory and take the aforementioned friends to see the observatory also and check out what Franco and Lara Albanese get up to with their education and outreach programme. They make these really amazing black silouhette puppets out of wood and card to teach the children in the region about astronomy and culture.